With a national market share of 34% and an increase in total admissions of 4% in the first half of 2013, Danish films and cinemas are doing very well. While that is certainly gratifying, it takes more than a healthy theatrical market to lift the total film revenues, DFI CEO Henrik Bo Nielsen says. The market share set a new record in 2012, as 33% of the audience chose to buy tickets to Danish films. Now that the figures for the first half of 2013 have been tallied, things are looking every bit as promising this year, with a national market share of 34% so far, corresponding to 2.25 million admissions to Danish films in the January-June period. In general, the first-half figures indicate that a lot of Danes still like to see films on the big screen. Compared to the same period last year, 4% more cinema tickets have been sold, landing the total number of admissions in the first half at 6.46 million. “The positive theatrical results are particularly interesting because they were achieved at exactly the same time that hundreds of thousands of Danes got access to streaming services like Netflix, YouBio and HBO,” Henrik Bo Nielsen, CEO of the Danish Film Institute, says. Danish films that opened at the start of the year were particularly successful. The Hunt by Thomas Vinterberg, My African Adventure by Martin Miehe-Renard, and All for Two by Rasmus Heide alone sold a combined 1.47 million tickets, or roughly 65% of all admissions to Danish films in the first half. These three films also top the list of most seen films in 2013. The success in the theatrical market, however, is not enough to make up for the financial troubles stemming from the declining DVD market. “The good theatrical result, unfortunately, does not say very much about the overall economy of the film industry. Cinemas are doing well, but preliminary figures indicate that sales and rentals of physical DVDs continue to decline. It hardly seems likely that revenues from online sales will compensate for the declining revenues from DVD sales,” Mr Nielsen says. Revenues from sales and rentals of physical DVDs have long been declining in Denmark, and now TV consumption has begun to fall as well. Danes watched 13% less TV in the first half of 2013 than in the same period last year. At the same time, Netflix has gained around 400,000 Danish subscribers, making it the biggest streaming service in Denmark at the moment. Unlike DVDs and TV, the movie-going experience has remained popular. “The first-half results will hopefully whet the appetite of distributors and rights-holders and inspire them to experiment. It’s very good news that cinema admissions have stayed robust. That makes it possible to explore other ways of growing the total film revenues. The theatrical window is important, to be sure, even crucial, but it’s not enough to lift the total film revenues that are necessary for creating a healthy economy,” Mr Nielsen concludes. 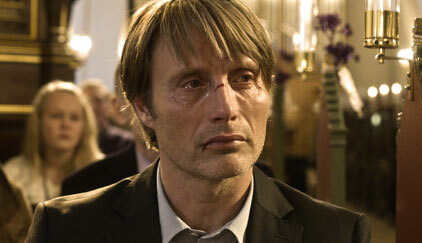 Thomas Vinterberg’s The Hunt, selling 673,000 tickets, was the most popular film in the first half of 2013.